The Communication Services sector is currently one of the most overbought sectors, with the ETF (XLC) sitting over 2 standard deviations above its 50-DMA. Remember, this sector was introduced as a combination of the old Telecoms sector and some members of the Technology sector. 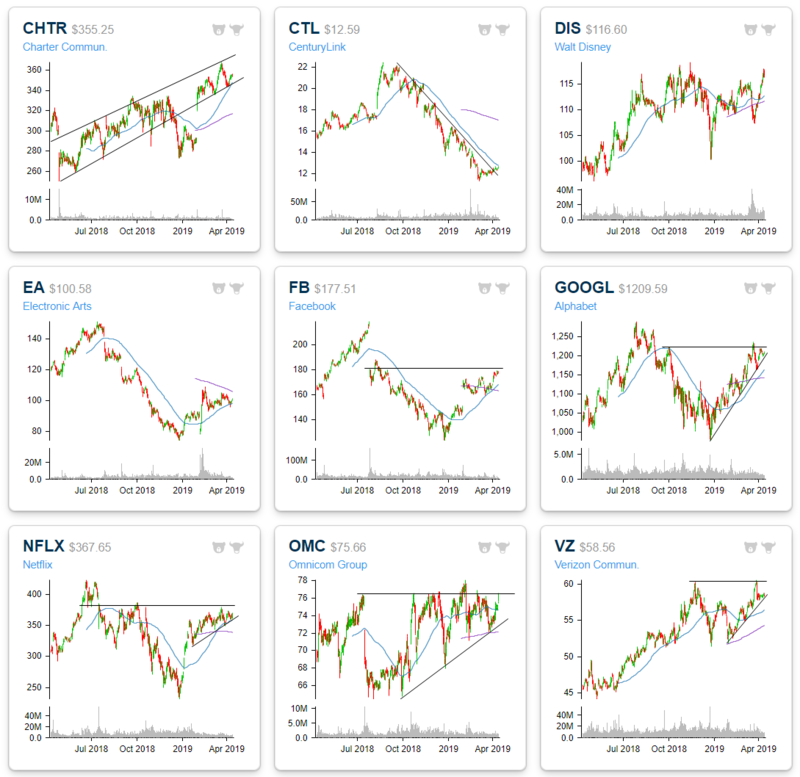 Within the sector, several companies are setting up constructively near resistance despite the overbought levels of the index overall. Below we highlight some attractive names in the sector as well as some that are reaching pivotal points. For starters, Charter Communications (CHTR) sold off hard in late 2018 after sitting in an uptrend for most of the year. After a strong earnings report in January, the stock gapped all the way back up into this uptrend channel and has continued to move within it ever since. More recently it has pulled back to find support at the bottom of this uptrend channel just above the 50-DMA and has begun to once again move higher. CHTR also has a good timing score in our Trend Analyzer tool. While CHTR’s been in a strong uptrend, CenturyLink (CTL) is looking to shake its downtrend from the past several months. After reaching highs in the late summer/early fall of last year, the stock sold off finding a bottom in early March of this year. This recent leg higher has brought it through this downtrend line, and in the past few days, right up to the 50-DMA. Granted, the stock is down big today (over 3% as of this writing) erasing the past week’s gains and failing this test of the 50-DMA. That technical development is not promising. Given that it is hard to eagerly jump on the bullish side for the stock as CTL also has had weak fundamentals for some time now. On the other hand, a rebound taking out the moving average could be sign as a bullish indicator. We would typically wait for at least a couple of “higher highs” and “lower lows” before declaring the start of a new uptrend. Major video game publisher Electronic Arts (EA) is also seeing an interesting setup. The stock fell out of favor in 2018 but gained strength so far this year. A declining 200-DMA and rising 50-DMA have been converging with price consolidating between the two. Similarly, a move above the 200-day would be a good sign for the stock. Like CHTR, EA also has good timing in our Trend Analyzer. Three-quarters of FANG also belong to this sector. Each one has been in a solid uptrend so far in 2019, but are now fairly overbought. Social media giant Facebook (FB) is the best example. It is one of only three stocks in the entire sector to do be more than two standard deviations above its 50-DMA. FB, NFLX, and GOOGL are also all running up to resistance from highs before the Q4 sell-off. While the overbought indicates an increased likely hood of some bias to the downside, taking out these resistance levels would certainly be a sign of health for this year’s uptrends to continue. Omnicom (OMC) has recently bounced off of the 200-DMA and is now sitting at the upper end of the range it has traded within for the past year. At the same time, the stock has been making a series of higher lows which is a promising sign that it could finally break out of higher. Finally, turning to Verizon (VZ), a couple of weeks ago the stock failed a test of 52-week highs. This comes after bouncing off of support just above $52. After pulling back, the stock has found support at its uptrend line and has traded along it all week. If this uptrend continues, another test of those highs could be a very promising sign. 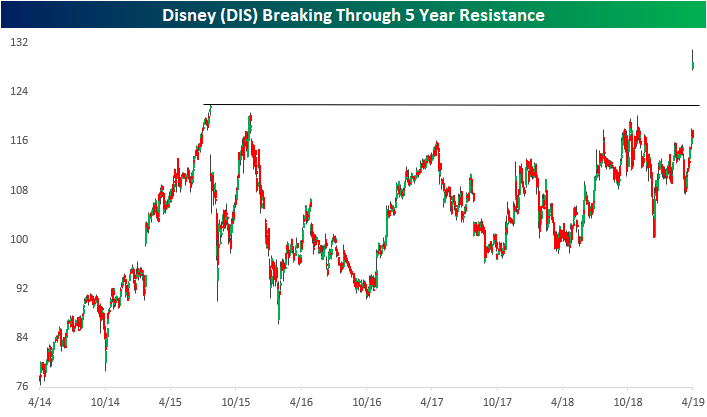 Delving into Disney (DIS), today’s surge in response to its announcement of the pricing of the company’s new streaming service has brought the stock up to an interesting level. For the past five years, DIS has been unable to retake highs near $120 set back in early August of 2015. While it has come within several dollars of these highs a couple of times in October of 2015 and 2018, the stock has more or less been stuck in a range if not a very slight uptrend in this time. Now at all time highs by a fairly wide margin, DIS will be an interesting stock to watch; and if today’s gap is to get filled at any point in the future, that prior resistance will be a critical place to watch.